A word not very popular amongst most rope duckers - yes, ski patrol are out there to stop us having fun sometimes. They are paid a not so awe-inspiring 780 yen an hour but, if things do get a bit rough, we still expect them to be able to save our lives. Niseko has a total of 31 patrollers who are responsible for safeguarding 57 runs totaling over 47 kilometres of groomed ski slope. At the same time the same guys and girls are also looked upon to carry out rescues in over 30 square kilometres of Niseko backcountry. I shared a few beers with a group of Hirafu patrollers and asked them about their experiences, and how they feel about having such a huge backyard to look after. 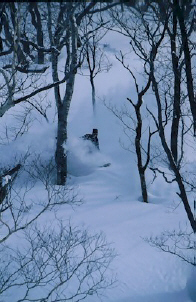 Riding out of bounds is a no-no in Niseko. It is, however, something that is not enforced 95% of the time. I ask Shin why we rope duckers are allowed to roam free for weeks, and then why suddenly there is a crackdown and the games are forced to begin. Shin takes a good swig of beer and tells me it's not a personal thing but more a case of being at the wrong place at the wrong time, and also that some days are determined to be more dangerous than others. 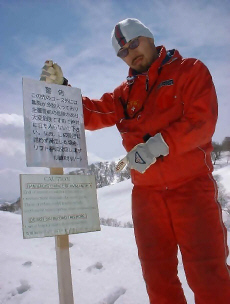 His colleague Hiro (four years patrolling in Hirafu) elaborates, explaining that on high avalanche-danger days, patrol members are put in a difficult position. On one hand they still prefer powder-seekers to be skiing or riding in relatively safe areas like Strawberry Fields (located down low within Hanazono 1 resort limits) - rather than riding way out backcountry, such as off the Niseko peak. But at the same time, especially on the more crowded weekends, tracks leading off into tempting areas like Strawberries will often encourage less experienced challengers to get themselves into trouble. I counter and suggest that the only way to get experience is to ride these areas, and that Niseko's magic is there to be experienced by all. Hiro, an avid deep powder skier and boarder agrees, but whilst taking a largish gulp of beer, explains that there are only five patrollers assigned to the whole Hanazono area, and with one person always on holiday, that leaves four to do everything. So when it's busy, they often have their hands full just looking after injuries within course limits. I ask who then is free to mount a rescue if someone gets lost or hurt riding off the peak? There is a pause, and a quiet "Nobody really...", is the reply. Another moment of silence follows. Shin adds, "We always will go and help someone, but it can take time. I set out with a rescue party to find a guy who got lost skiing off the peak a while back [see Slides and Sliding article]. This time he was lucky - he had stopped right in the middle of a snow-covered road, so it was easy for us to spot him from the snow-groomer. Even then, he did have to wait quite a while. Had he been elsewhere, it would have been tricky - no beacon or anything. If he hadn't appeared after an initial search, more local volunteers and the army would have been called in, but I doubt they would have located him before nightfall. And he wasn't wearing very much..."
Shin explains that in the case of an emergency, patrollers from the various resorts will combine with local volunteers in a search. He stresses that the mountain itself is under-staffed, so launching such an operation can actually put resort patrons at risk. Hiro also states that the victim is invoiced a considerable sum for the operation. I enquire as to whether patrollers are paid anything extra for the risk of going backcountry to save someone. The group look at each other and reply, "Nup..., we get our normal hourly rate... At the same time, as it is not really part of our contracted job, we also have the right to decline going on a rescue." When I ask why anyone would say no to going, Shin replies that not all patrollers have done avalanche courses, so only those who feel confident participate in backcountry rescues. "But this is Niseko - the land of powder, and tree runs, and ridiculous amounts of snow falling - how could any patroller not be aware, and not be trained properly? ", I stammer. Matsu the most senior patroller in the group speaks up. "There are no job qualification requirements to becoming a patroller here except for having passed the Level 1 skiing competency test. 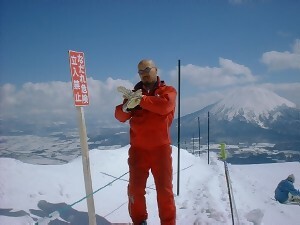 At last count only three of us hold official SAJ (Ski Association of Japan) patroller licenses." I ask if this SAJ certification is a good thing, and if it's difficult to obtain. Matsu replies that he thinks it's worth doing, and that it's not really difficult. "All you need is Level 1 ski certification and to have done a Red Cross first aid course. Then it costs around 50,000 yen (accommodation costs included), and about 5 days to do the course and tests." 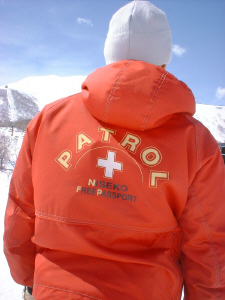 Matsu emphasizes that originally Niseko patrollers started out as volunteers, and although this turned into a paid position about 16 years ago, the four companies that run the resorts haven't introduced any real qualification requirements. It is my turn to take a big swig of beer. "What about first aid?" "All of us have done a first aid course at some point. It really depends on the person - some are more interested in first aid and are quite skilled, others enjoy skiing backcountry and have some avalanche experience. The company will pay for us to do most courses that are related to work, but it is up to the individual to enroll and study him/herself. Nothing is compulsory." I look around at the collection of faces and get the impression that depending on where and when someone gets into trouble, the level of response might be considerably different. I ask the others if they have SAJ patroller certification? No one else does... I ask them why not? There are various murmurs, something along the lines of "I guess, really should do it." or "No time - maybe next season", but no real straight answer is given, nor does anyone seem really determined to become qualified. Shin, possibly sensing my sudden growing feeling of dread, adds; "Everyone has learnt how to perform CPR and injury immobilization. We do have to deal with a large number and variety of accidents every year, so I guess we get a fair amount of practice. It would be better though if there were regular courses everyone could attend during the season." I approached Mr. Tachibana of Tokyu (the company that owns Hirafu) and asked him why such courses are not standard practice. It appears budget, as well as the logistics of trying to find time to run a seminar mid-season are the main problems. "We do financially assist those who want to go and study more, but with resort work commitments, patrollers mostly have to do the courses out of season. It is really up to the individual." comments Mr. Tachibana. He does, however, appreciate the difficulties involved in trying to do an avalanche course in the middle of summer. 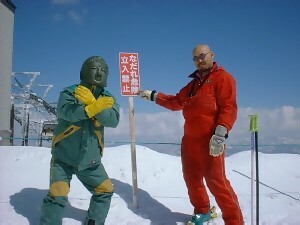 Mr Tachibana assured me that the idea of introducing compulsory patroller's first aid and avalanche courses next season is being looked at seriously.